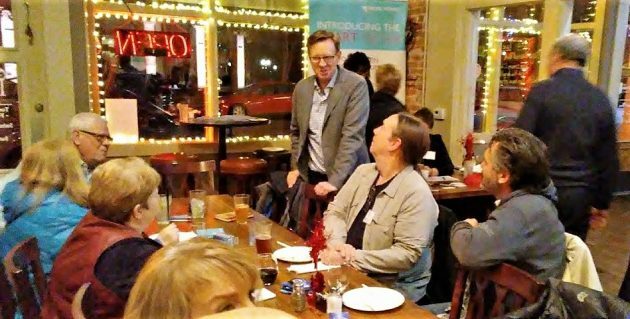 Pacific Power CEO Stefan Bird chats with people attending the “pub talk” at the Independence Grill Tuesday. 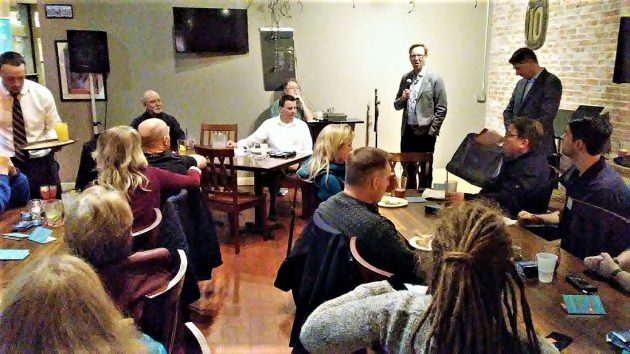 It was billed as a “smart tech pub talk” led by Scott Bolton, a senior VP of Pacific, and Stefan Bird, president and CEO of the Portland-based utility. Bolton talked about Independence’s efforts to grow its economy based on technology, a theme that’s in line with Pacific’s smart meter program. Bird talked about the company’s need to modernize the metering system as an “intelligent network” to match the requirements of the coming “smart grid,” in which consumption of electricity has to be closely and quickly aligned with various new generating sources to a greater degree than ever before. One benefit is lowering the cost of operating the grid. That, anyway, is what I got out of his remarks. The two new details I learned from Mike Cochran, the managing director of the company’s metering business. They are that Pacific expects to spend around $117 million on the smart meter program, and that the conversion will mean the elimination of about 110 meter-reading jobs, out of a companywide work force of about 5,000 in six states. To the extent possible, people affected will be absorbed in other jobs within the company. The new meters are two-way radios that transmit consumption data and allow the utility to respond if necessary. For example, the company could remotely shut off power for nonpayment without having to send someone to the address. For customers, the main benefits being cited are that the utility will be able to instantly detect power failures, and their extent, enabling repairs to be started faster, and that customers can monitor their power use hour by hour and respond accordingly if they want. People can also set an upper target for their bills and be notified when the bill gets close. Installation of the meters will start in Lebanon on Feb. 19, the company has said. The starting dates are March 5 in Sweet Home, March 26 in Albany, and April 23 in Corvallis. The wireless network making the meters possible will consist of small boxes to receive and transmit signals. They’ll be mounted on existing power poles, and no new poles are contemplated. As for radiation, the company says 70 million smart meters are in use across the country and no health effects have been documented. The amount of exposure over 20 years is said to the same as a 30-minute cell phone call, minuscule compared to all the electromagnetic signals already out there. Bird said an intelligent network of smart meters is necessary for the power grid of the future. Great. More little devices sending out radio waves with potentially more instances of interference with every other electrical item in the house. Will this cause cancer??!! Smart Meters run in the 900 MHz range, which is around the same frequency of those old cordless phones we all used in the 90’s. They’re FCC compliant and used all over the country, so they’re not going to interfere with “every other electrical item in the house” and they’re not going to give you cancer, James. We don’t know what meter readers make per year but a guess might be 70 K. At that rate it appears that it would take about 15 years to save enough to pay the cost of installation. Not counting cost of money of course. Will miss the monthly greetings. we don’t know what meter readers make per year but a guess might be 70K. At that rate it appears that it would take about 15 years to save enough to pay the cost of installation. Not counting cost of money of course. Will miss the monthly greetings. You probably got enough radiation exposure (X-ray) from an old TV in a day than this widget can emit in years. Thank you for the article with additional information. I wonder: Smart reader? What else will it do? Turn off or limit amount of electricity use? Don’t try to tell us they can’t or won’t – they can and potentially could and/or will. Don’t be so paranoid. They’re a public utility that has to submit to regulation by the PUC so they can’t just do those kinds of things willy-nilly. Or could they increase rates during peak time to punish consumers for using energy during those times. Possibly a tool to continue attempting to force a leftist energy policy on everyday people? Or, perhaps, reduce rates during off-peak hours to reward consumers who wish to take advantage of reduced load times. Not “leftist energy policy.” Just good, capitalist economics. If they increase rates during peak times and customers respond in their own economic self-interest by time-shifting, then the power companies can avoid having to spend a fortune to expand capacity. Needlessly expanding capacity will punish everyone with higher costs at all times. Thank you Howling. Nothing “leftist” about this. It is, however, Corporatist. Nothing says “leftist” like door to door sales by PP stooges trying to get folks to sign up and PAY for their renewable energy initiatives. Soon after the new SmArT meters are installed, they’ll be back. Knock knock.